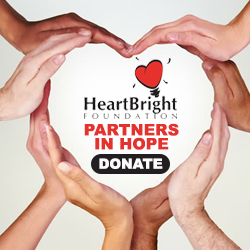 Thank you for considering becoming a HeartBright Foundation Corporate Champion. With corporate and patron support we are helping to make the Charlotte community a healthier one. Ninety-three cents of every dollar we raise goes directly to fund our local programs and services. It takes only $50 for our team to treat a patient for a year at our center. Please see our information sheet to learn more about the important work that we have been doing in the Charlotte area since 2003. HeartBright Invitational and our Soiree & Wine Auction websites.